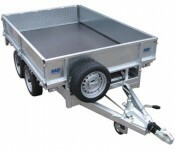 There are 8 Models in the 16 series Range of 5'6" (1680mm) Wide Flat Trailers with a choice of 2 lengths (8' & 10') 4 weights and 2 standard tyre sizes. 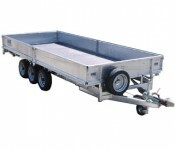 There are a further 11 Models in the 20 series Range of 6'6" (1990mm) Wide Flat Trailers with a choice of 3 lengths (12',14, & 16') , 3 weights and 2 axle configurations. Designed using the latest 3D CAD design technology, these trailers are available as standard with a flat platform and with options of removable head board, drop sides, loading ramps weld mesh side extension kits and much more.